Japanese Maple ‘Orangeola’ – A cutleaf Maple. Bright red new foliage in spring that turns to a bronze and green colour as it ages makes ‘Orangeola’ a very attractive plant. The standout fiery orange to red autumn tones give it its common name and makes it a beautiful plant at this time of the year. With a natural weeping habit this is a small tree that will reach around 2 metres in height. Its natural spreading or mounding habit means it will spread to around 2 metres across. The foliage is fine, lacy and heavily dissected or cut leaf. This is a slow growing variety and it is suited to growing in containers. With the added advantage of holding its foliage late into autumn ‘Orangeola’ is a brilliant landscaping plant. 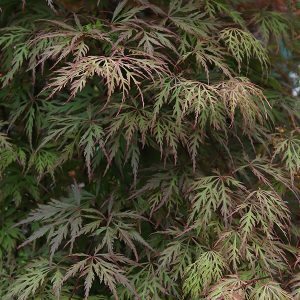 Like most Japanes Maples, Acer palmatum dissectum ‘Orangeola’ is actually quite hardy once established. It will perform better in a protected position, away from hot drying winds and the heat of the afternoon sun. Planted on the shady side of taller trees in good soil it performs remarkably well. When planting, dig the hole twice as wide as the rootball. Dig in some well roted compost, cow manure and a little blood and bone. Stake the plant until it has time to establish a strong root system. Water in well with a liquid seaweed fertiliser and water well through the first few summer. Mulch around they plant to maintain a cool moist root run. With its natural dense growth and rounded habit Acer palmatum dissectum ‘Orangeola’ requires little to no pruning. This is a versatile Japanese Maple, use it as a specimen tree in a lawn, in a part shaded position in the garden border, or grow it in a container in a courtyard. Look for it as grafted standard where it can be used as an impact plant from spring through to winter. How much will they cost ? From $40 – 50 for small specimens through to $500 for a larger 3-4m established specimens.